Like a Hollywood producer who can’t find any original ideas, it seems First Minister Nicola Sturgeon is determined to make Indyref2: The Sequel. Her problem is that nobody wants to see the same old story told again just with a different cast of actors. 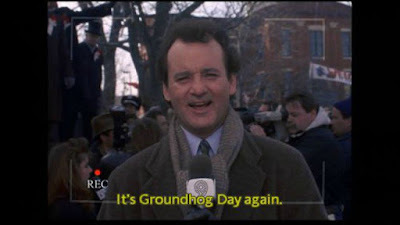 There’s a reason they didn’t make Groundhog Day 2. Of course the SNP’s argument would be that indyref2 is justified because Brexit has changed the story; but does that really justify Scottish voters being subjected to yet another soul-sapping referendum before we even know what Brexit actually means? It would be the worst sort of political opportunism to call indyref2 while Westminster is distracted with Brexit negotiations. The polls still suggest we’d vote No1, so surely we want Westminster focused exclusively on achieving the best possible Brexit deal for all of us in the UK? When those negotiations are completed and we know what Brexit actually means, then would be the time to take stock and ask the people of Scotland if they have the appetite for yet another referendum. It’s not as if the SNP don’t have enough on their plates exercising the increased powers they now have. Our First Minister is undoubtedly a talented politician, but her party isn’t blessed with great depth in talent. My sense is that hard-working Scots would rather see the SNP’s scarce resources directed away from creating division and towards improving our lives here and now. Nicola Sturgeon once famously said that her party’s obsession with independence “transcends the issues of Brexit, of oil, of national wealth and balance sheets and of passing political fads and trends”. This is really just a long-winded way of saying “independence or bust”. I believe her too. On the SNP’s watch our education system has declined from being one of the best in the world to being no more than average2. Hospital waiting times in the fully devolved Scottish NHS have risen3. Having been granted the tax powers to redistribute wealth more fairly and the welfare powers to top-up benefits for those hardest hit by austerity, the SNP have chosen inaction. This is what happens when you have a party governing Scotland who dismiss anything other than furthering the cause of separation as “passing political fads”. But a leopard doesn’t change its spots and the SNP never knowingly miss an opportunity to stoke grievance if it helps them create division. Their relentlessly repeated assertion that Scotland is being “dragged out of the EU against our will” certainly strikes an emotional chord with many - but Scottish voter aren’t mugs. Most realise that sometimes having to accept the wider democratic will of the whole UK is a price worth paying for retaining the benefits of pooling and sharing with our closest neighbours. Some claim the Brexit vote shows Scots are somehow emotionally closer to the EU than the UK, but that argument doesn’t withstand a moment’s analysis. The people of these islands quite clearly have more enduring historical, linguistic, cultural and economic bonds with each other than we do with our European cousins. The current dominance of the Tory party in England may be a concern for many, but the rise of populist right-wing movements in France and Holland is arguably a greater worry. Opposition parties may be in disarray, but political winds change and tides turn; decisions about the very existence of the UK should transcend party politics. Whatever the reasons, the polls show that Brexit hasn’t been the game-changer the SNP clearly hoped it would be. Perhaps this is because Brexit has actually made the choice clearer. In an indyref2 the question would effectively be: do we choose to remain in the UK single market or hope to remain in the EU single market? The economic case couldn’t be simpler. After over 40 years of free access to the EU market, Scottish exports to the rest of the UK are four times greater and still growing faster4. If we have to choose which side of any EU/UK trade barriers to be on, we surely have to choose the UK side. In the UK we currently pay about £150 per person a year as members of the EU. In contrast, Scots are currently “paid” (receive an effective net fiscal transfer of) £1,700 per person a year as members of the UK5. This is money we’d immediately lose if we left, it’s a direct benefit of the on-going pooling and sharing the No vote guaranteed. The SNP’s White Paper on independence attempted to disguise this reality by making the hopelessly optimistic assumption that this year we’d generate £6.8 – 7.9bn of oil revenues to help plug that gap. We now know the actual number will be close to zero; they tried to sell us a pup. Then there’s the practical question of when and under what conditions Scotland might actually join the EU if we leave the UK. Given we don’t have our own stable currency and run what in EU terms is called an “excessive deficit”, there are no guarantees. An independence referendum could well see Scotland end up outside the UK and outside the EU, further isolated in an increasingly uncertain and unstable world. Leaving the EU may well be harmful to our economy, but Scotland leaving the UK wouldn’t fix it. Put simply: two wrongs don’t make a right. Scotland's schools have recorded their worst ever performance in an international survey of pupils. Scotland's scores for maths, reading and science all declined in the latest set of Programme for International Student Assessment (Pisa) figures. It was the first time since the tests began in 2000 that all three subject areas were classed as "average", with none "above average". I couldn’t agree with her more. It’s refreshing to hear the SNP leader recognising that Scotland gets a great deal out of our membership of the UK. It is, after all, only because of ongoing UK-wide pooling & sharing of resources that, despite the collapse in North Sea oil revenues, we’re able to maintain Scotland’s higher levels of public spending. In fact we can see how much of a “better deal” we get by simply looking at the Scottish Government’s own Government Expenditure and Revenue Scotland (GERS) report for 2015-16 and comparing Scotland’s figures with those for the rest of the UK. Using round numbers, in Scotland we raise £400/person less in taxes but we receive £1,300/person more in public spending. This means we receive an effective fiscal transfer from the rest of the UK of £1,700/person - that translates into £9bn a year. Despite what you might read among the murkier backwaters of social media, these GERS figures are robust1. It’s worth noting also that per person spending differences have nothing to do with allocated Defence, Debt Interest or International Affairs costs, because those are apportioned on a population basis. The list goes on: Scotland spends more per person than the rest of the UK in pretty much every area. 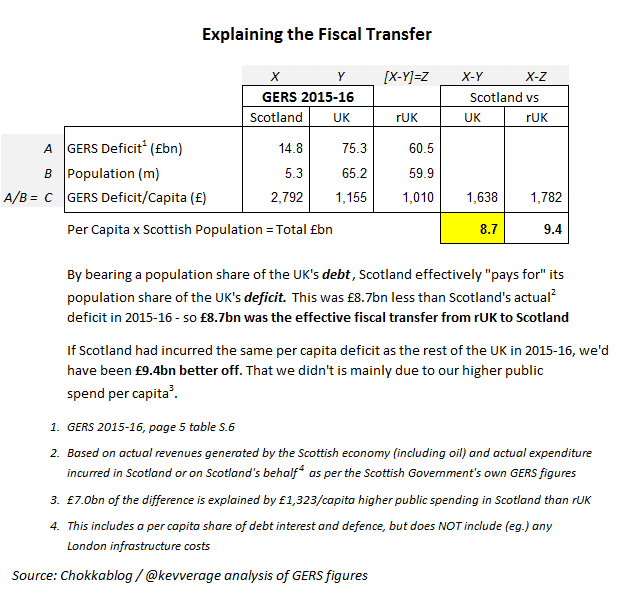 Those who argue that Scotland’s GERS deficit is somehow a poor advert for how Scotland is served by being in the UK miss this basic point: the UK allows us to spend more on public services than we could otherwise sustain - that’s the main reason we have a higher deficit, why the £9bn deficit gap (the famous “black-hole”) exists. This isn’t about being “subsidy junkies” either. A core principle of our economic union is that public service levels should be similar wherever you live in the UK. Scotland’s geographically dispersed population, remote island communities and particular demographic challenges means it simply costs more to deliver the same levels of public services in Scotland. This argument is of course somewhat undermined when we have a Scottish Government that diverts money away from helping the most needy and uses it instead to fund vote-winning freebies that well-off Scots (but not our English neighbours) get to enjoy. But that’s a debate for another day. If you’d rather take a more transactional view of the union, it can reasonably be argued that higher public spending in Scotland now is simply payback for sharing “our oil” during the boom times. Indeed it can be shown that, despite our ongoing higher spending levels, Scotland is still a net positive contributor to the UK economy since the oil boom began in 1980. We have no need to feel embarrassed about getting our reward for that today. So I can agree with our First Minister that Scots taxpayers currently get a great deal out of being in the UK. 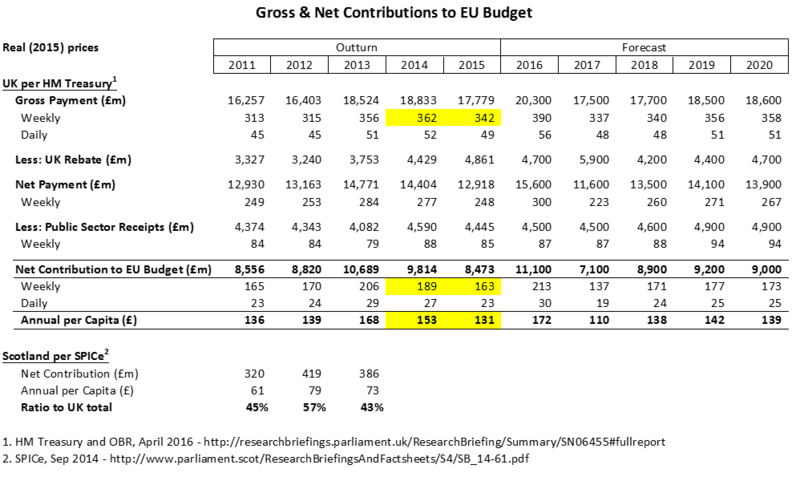 So what is it about Brexit that makes the SNP insist it’s worth reconsidering independence and guaranteeing we’d lose that £9bn fiscal transfer? As a Remain voter I get the emotional arguments, but as a businessman I also appreciate the hard economic realities. Scotland currently enjoys free access to two single markets: the UK and the EU. 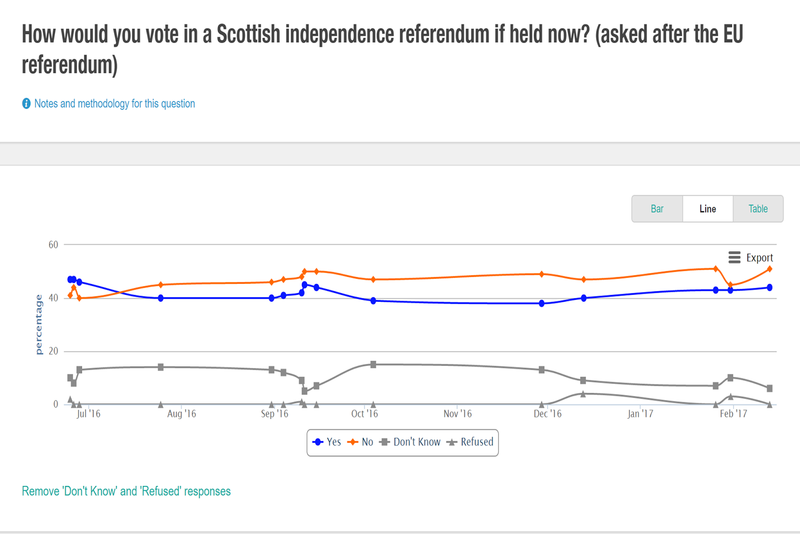 In the context of a hard Brexit, it’s increasingly clear that a second independence referendum wouId require Scots to decide between free access to one or the other. 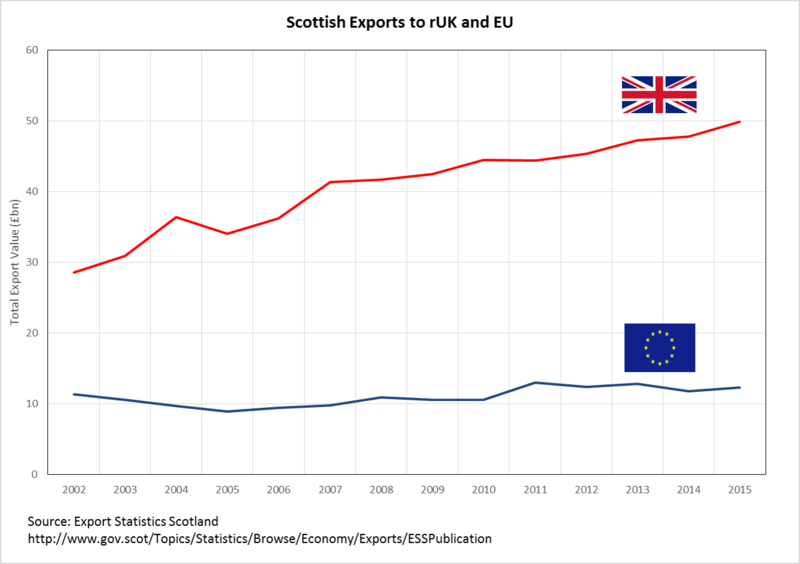 The graph below shows that Scotland exports over four times as much to the rest of the UK than to the EU and that – over a period when we have enjoyed free access to both markets - exports to the rest of the UK have grown much faster than those to the EU. Combine this with the £9bn fiscal transfer and it’s clear: the economic arguments for Scotland remaining in the UK are stronger now than they’ve ever been.